BUTAOTOME Acoustic Singing Vol.9 (豚乙女 歌うアコースティック Vol.9, Buta otome Utau Acoustic Vol. 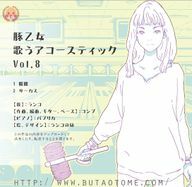 9) is an original doujin album by BUTAOTOME released on 2014-04-27 (M3-33). It features original vocal compositions. They are acoustic versions of two previously released songs. This page was last edited on 21 December 2016, at 21:38.